Tokyo Otaku Mode Becomes First Worldwide EC Site to Offer Full Custom Order Replica Japanese Swords! TOKYO - Tokyo Otaku Mode Inc. (incorporated in Delaware, U.S. by President and CEO Tomo Kamei), the managing body of Tokyo Otaku Mode (TOM), a worldwide distributor of otaku content including anime, manga, and cosplay, announces that it has begun worldwide sales of full custom order replica Japanese swords on its e-commerce site, Tokyo Otaku Mode Premium Shop (http://otakumode.com). The full custom order replica Japanese swords are fully customizable down to the nine parts that make up the sword––the saya, samegawa, tsukamaki, menuki, tsuba, kashira, kojiri, toushin, and sageo––which are available in different colors and designs, meaning that customers can freely combine the parts to create a one-of-a-kind sword. In all, there are 583,200 possible combinations. This also marks the first time that full custom order replica Japanese swords have been made available for worldwide customers through an e-commerce site*. *According to research conducted by Tokyo Otaku Mode, the Tokyo Otaku Mode Premium Shop is the first e-commerce site to offer full custom order replica Japanese swords. 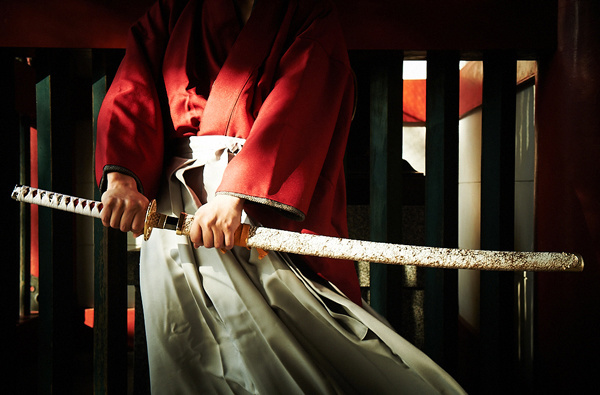 Among the Japanese anime and manga that are popular overseas, many contain characters themed after samurai and ninja or characters who use Japanese swords. This has led many overseas fans to have a deep interest in Japanese swords. There is also a great need for Japanese swords among these fans as collector’s items or cosplay props. There are many fans with an interest in replica Japanese swords even on Tokyo Otaku Mode, and as a result of sales on the Tokyo Otaku Mode Premium Shop, it has become clear that they are highly sought after. On the other hand, replica Japanese swords are a niche product and because of current limits in quantities and styles, it can be hard to find one that suits your liking even in Japan. In order to meet these fans’ needs, TOM has begun offering full custom order replica Japanese swords to a worldwide audience in cooperation with Kotoya (Ukyo-ku, Kyoto, Japan; Representative: Erika Onishi), an online shop that sells replica swords, practice swords, and bamboo swords. 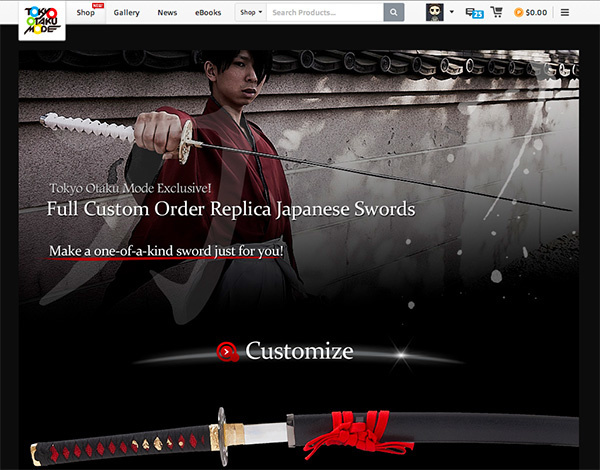 Customers can order their one-of-a-kind sword by visiting the special page (http://otakumode.com/shop/custom_sword/) on the Tokyo Otaku Mode Premium Shop and choosing the colors and designs of each of the nine parts that make up their replica Japanese sword. To date, TOM has focused on selling anime- and manga-related goods, character goods, and illustration collections on its worldwide e-commerce site, the Tokyo Otaku Mode Premium Shop (http://otakumode.com). 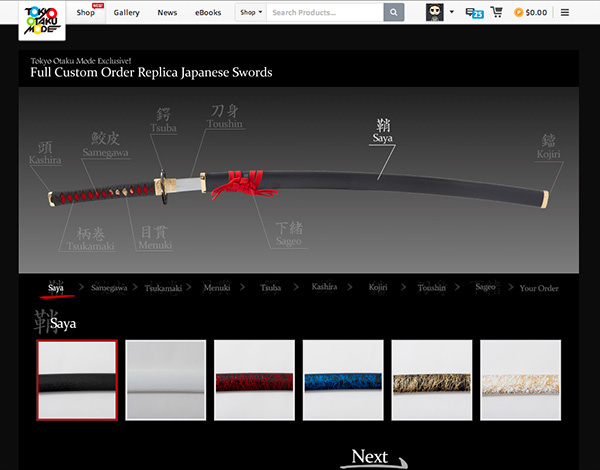 Now, they have expanded this lineup with the start of sales for full custom order replica Japanese swords. TOM will continue to expand the lineup of products it offers on the Tokyo Otaku Mode Premium Shop as well as offer more products that will attract customers. Tokyo Otaku Mode (TOM) is a worldwide distributor of otaku content––including, anime, manga, cosplay, and otaku entertainment news. TOM is owned and managed by Tokyo Otaku Mode Inc., which was incorporated in Delaware, U.S. in April 2012 by President and CEO Tomo Kamei. TOM began on Facebook on March 24, 2011 as a page for introducing to the world Japan’s otaku content––including anime, manga, games, and goods, as well as the latest news and event reports (http://www.facebook.com/tokyootakumode). A mere 22 months after its Facebook page was established, TOM surpassed 13 million likes to become the first Facebook page managed by a Japanese company to clear this milestone*. In the fall of 2012, TOM launched its web service Tokyo Otaku Mode (http://otakumode.com), which includes a user-generated content (UGC) platform on which Special Creators can upload their own otaku creations––such as cosplay, illustrations, figure photos, and latte art––as well as a news page for delivering to the world the latest news on otaku culture straight from Japan. *Any company or product names referred to herein are registered trademarks of their respective organizations.